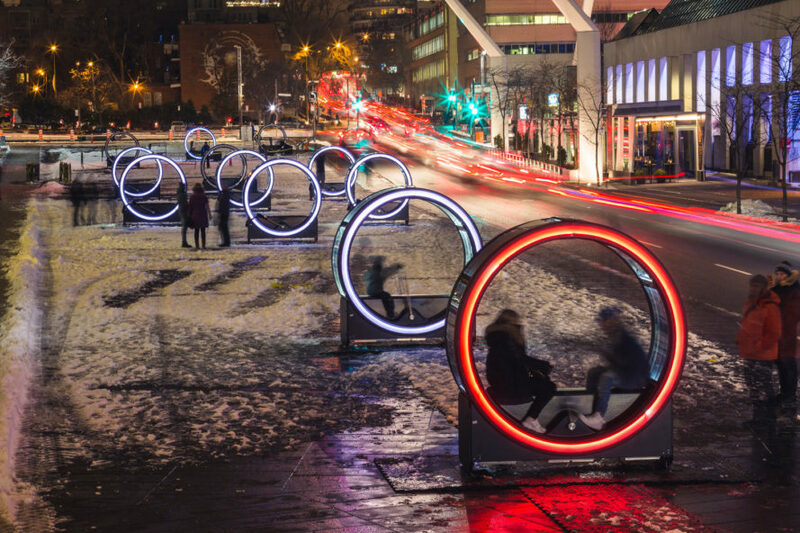 The streets of Montreal have come alive, illuminated with the series of 13 interactive wheels that make up Loop, an installation by artists <a href="https://oliviergirouard.wordpress.com/">Olivier Girouard</a> and <a href="http://www.jonathan-villeneuve.com/EN/index.htm">Jonathan Villeneuve</a> in collaboration with <a href="http://ottoblix.com/">Ottoblix</a>. 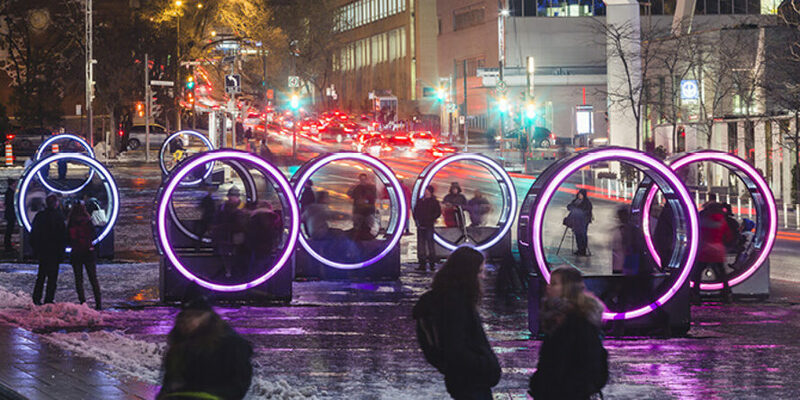 Loop is part of Luminothérapie, Quebec’s largest annual competition for temporary public art installations, which is also a traveling show. The display, which is comprised of 13 different tales with 24 images each, will be accessible to the public in Montreal through January 29, 2017, before moving on to the next city on the tour. Girouard and Villeneuve envisioned Loop as an interactive display inspired by the zoetrope, the pre-film era device that displays still images in a spinning frame to achieve the illusion of motion. 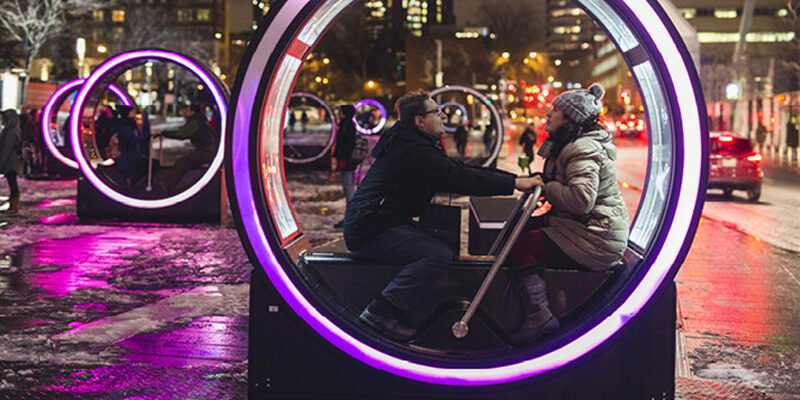 Following three months of design work and 800 hours of assembly, Loop emerged as a series of life-size interactive zoetropes, in which one or two people can sit. The occupants move a waist-height bar back and forth to engage a pump, which powers the spinning Loop and engages the light show. In the background, a flickering strobe illuminates the monochrome images, a throwback to early films. The speed of the image movement, as well as the tempo of the accompanying music, is linked to the control bar, allowing art lovers to create a custom experience. 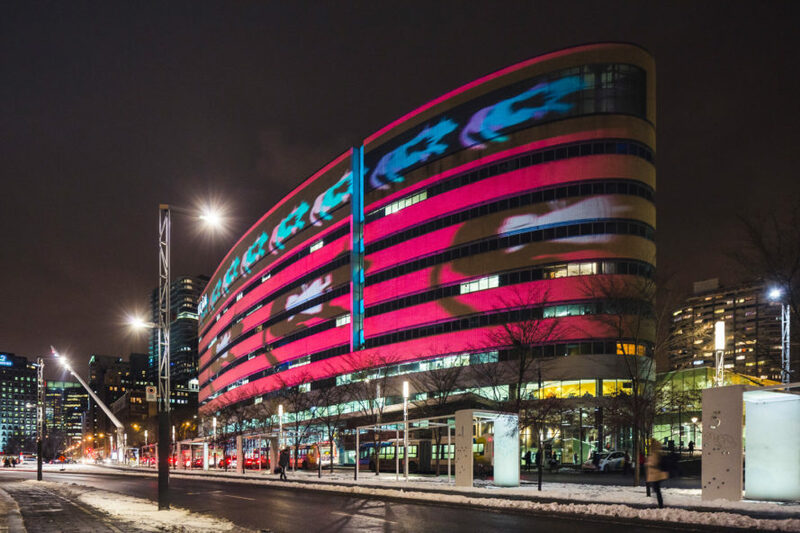 Each year, Luminothérapie presents an original, interactive, captivating winter experience in Montreal’s <a href="http://www.quartierdesspectacles.com/en/">Quartier des spectacles</a>. The competition is meant to stimulate creativity in the design of urban installations and digital art. The display travels from Montreal to other destinations in Canada, as well as abroad in the form of other related public art contests: Impulse in Brussels and Lugano; Entre les rangs in Cergy-Pontoise, France; and Prismatica in Ottawa and Georgetown (Washington, D.C.). 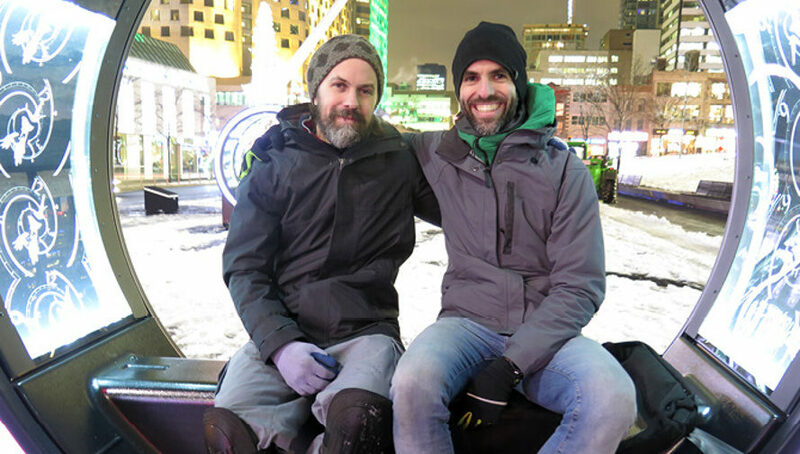 Artists Jonathan Villeneuve and Olivier Girouard pose in one of the Loop wheels. 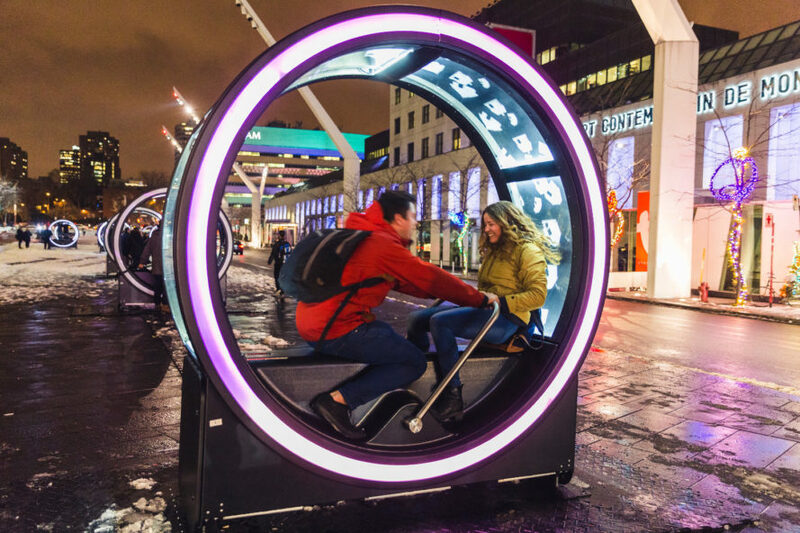 The streets of Montreal have come alive, illuminated with the series of 13 interactive wheels that make up Loop, an installation by artists Olivier Girouard and Jonathan Villeneuve in collaboration with Ottoblix. 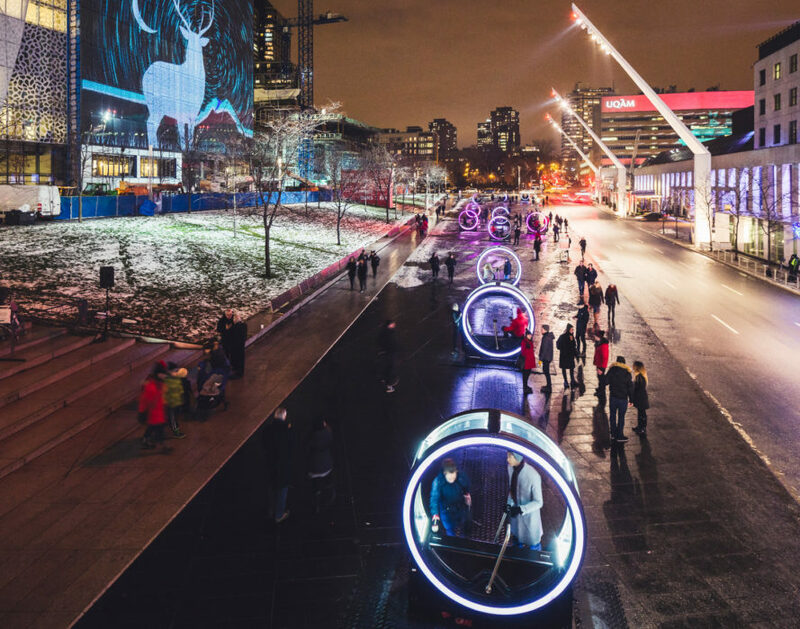 Loop is part of Luminothérapie, Quebec’s largest annual competition for temporary public art installations, which is also a traveling show. The display, which is comprised of 13 different tales with 24 images each, will be accessible to the public in Montreal through January 29, 2017, before moving on to the next city on the tour.